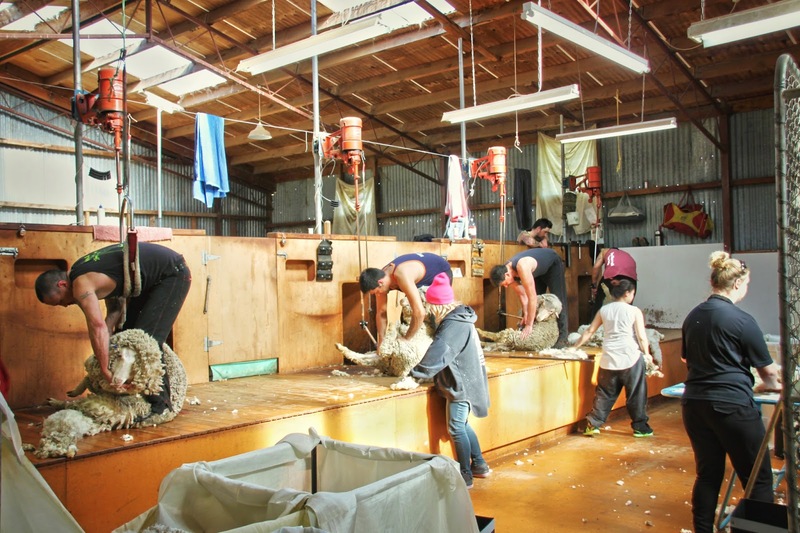 A couple of weeks ago I had the exciting chance to visit a shearing shed. This was one of the things high on my 'to-do/visit in NZ' list, I'm amazed that I could tick this one off so soon already! It was a very interesting and educational day for me as a spinner. So...especially for all fellow fiber enthusiastics (and others interested), here's a little photo journal of the visit! Above the shearing shed in action. On the far right you can see Shaun (my guide for the day and an employee of NZ Merino). Shaun is my housemate's brother, who kindly arranged for me that I could join Shaun on one of his shearing shed visits. The shearing team consisted of 4 shearers and lots of helping staff (guiding the sheep, swiping the floor, picking the wool, etc.). These guys can shear up to more than 100 sheep a day (per person! ), depending on the breed. The complete, average flock contains around 3000-4000 sheep here in New Zealand, so they often spend around a week at one farm. When the whole flock is done, they move on to the next farm...a kinda unique lifestyle! One that seems to be paying off quite good as well, according to one of the shearers I spoke with. 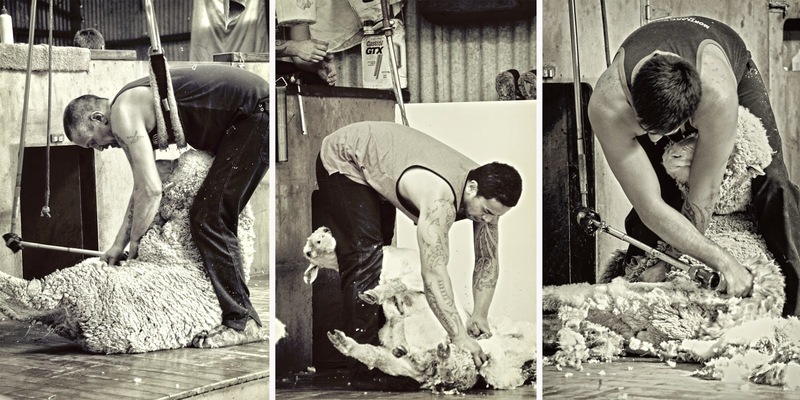 The better and faster you shear, the more money you make. Shearing contests are held regularly around these regions as well, which is another way to make big money. 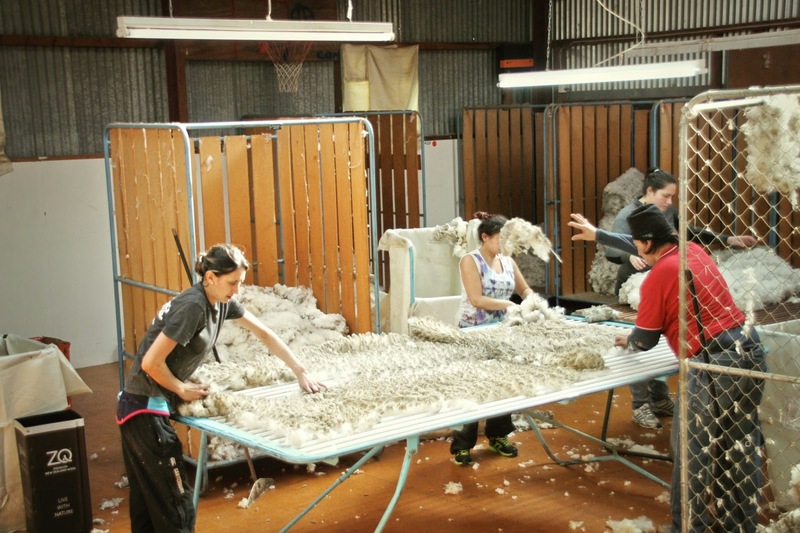 The shearers all work with their own gear, which they take with them everywhere they go. The machine shears have a power-driven toothed blade, that is driven back and forth over de surface of a comb (behind the comb teeth in the picture above...but they move so fast that you can barely see them!). 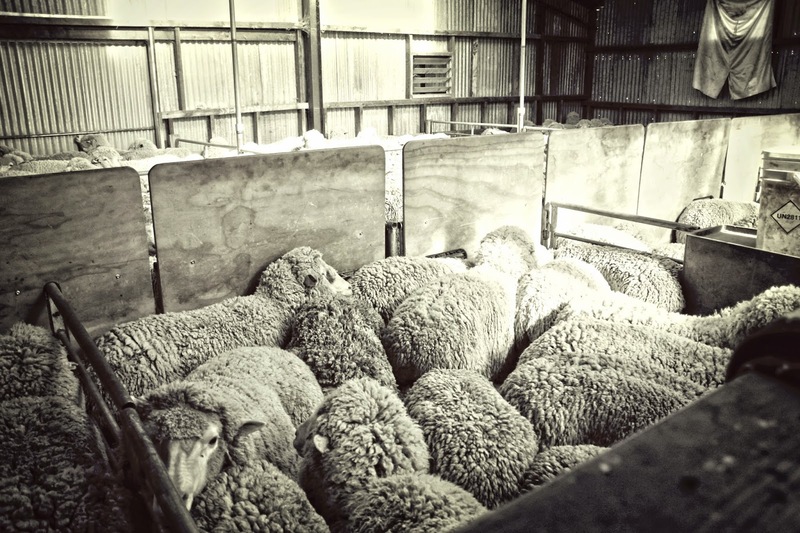 A little video of all the productivity that was going on in the shearing shed. There's a busy vibe, everyone's constantly moving. The team works together like a well-oiled machine, it was so fascinating to observe! Spreading out the fleece to pick, sort and class it. 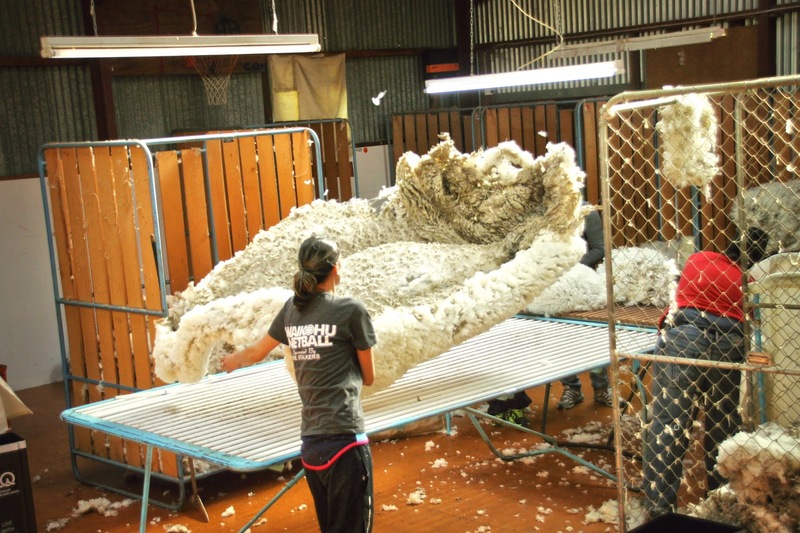 It's really amazing to see how big it is, and that the shearers manage to shear this all in one piece! 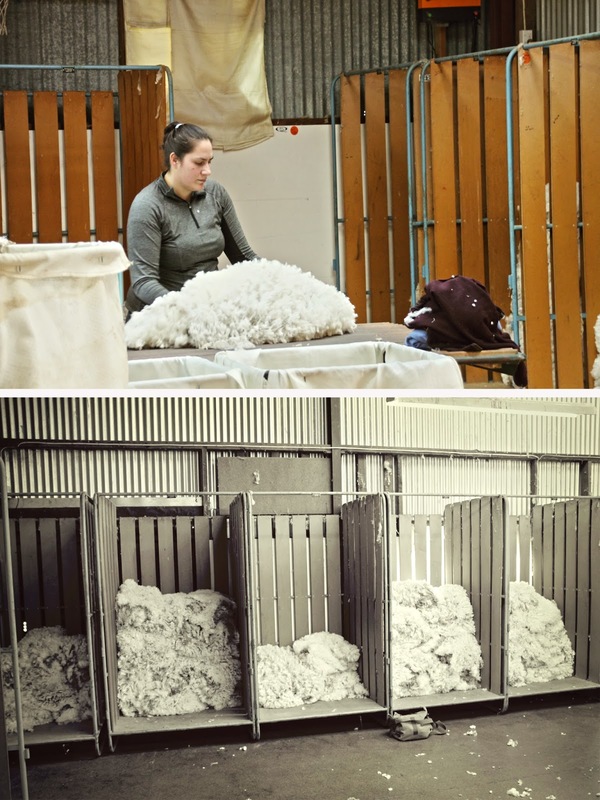 First the raw edges of the fleece are picked (also called 'skirting', this removes the dull and shorter locks), then the fleece proceeds to the classer...a person who looks at the quality and fineness of the fleece (see below). 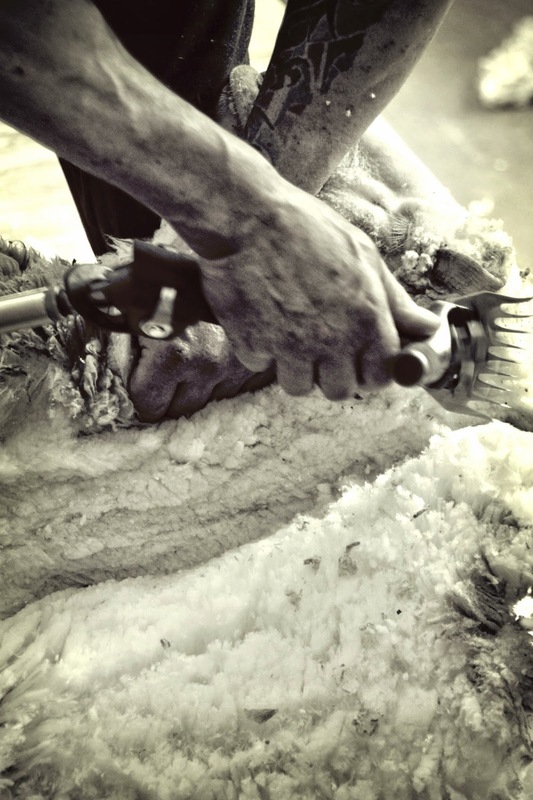 My favorite pictures of this day, the shearers in action. They work super quick, while constantly bended over (no surprise one of them actually used a kind of belt to support him). This job is physically tough, really tough. I was blown away by one of the shearers telling me that his niece, a small and skinny girl, is actually a top shearer...are you kidding me?! Now look at those jumps of joy when the shorn sheep are released outside! They just lost about 3-4 kg of wool, so they literally feel like a heavy burden is taken off them. 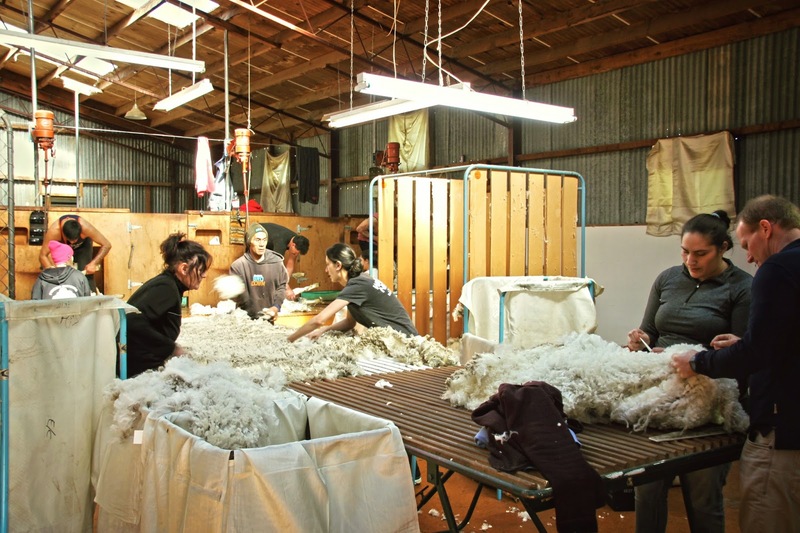 During the day Shaun and the shearers explained a lot about the whole process: what happens to the wool after the shearing, where does it go, who's involved, etc. If you'd like to read more about it, check out this wikipedia page that covers the basics pretty much, or ask me any question in the comments. It's interesting stuff! WOW that was really interesting, it reminded me of my favourite book, The Thorn Birds, although this is far more modern than in the book of course, and the book was set in Australia, not NZ, but you'll know what I mean! I hope you're enjoying NZ, and look forward to more posts from you in the future. Thank you Sharon! 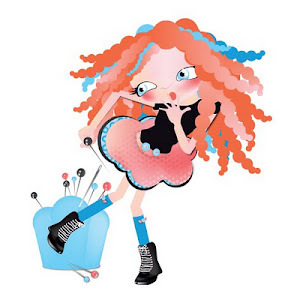 I'm always so delighted to hear from you! I've never heard of The Thorn Birds...but it does sound interesting, I will look it up :) There was such a special buzz in the shearing shed, I hope I managed to capture that buzz in my post (that's why I hád to include the video's, because they show it even better!). I'm definitely enjoying my time here in NZ and will continue to try posting updates... Big hugs back to you from the other side of the world!